Six sectors, including healthcare and realty , are expected to create a whopping 2.3 lakh jobs in India in the last three months of 2010, according to global consultancy Ernst & Young. Boosted by strong domestic economic recovery and improved global sentiment, most local industries are expected to increase their headcount in the coming months, E&Y said. As many as 2.3 lakh jobs are estimated to be created in India in the fourth quarter of 2010 by six sectors, Ernst & Young's Partner, National Head and EMEIA Leader (People & Organisation) N S Rajan told PTI. Image: More new jobs in India. The six sectors are healthcare, real estate, IT/ITeS, education & training, manufacturing and Banking, Financial Services and Insurance (BFSI). 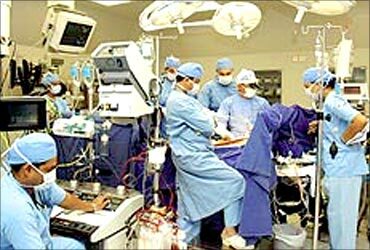 Among them, healthcare industry alone is projected to generate 60,000 jobs in fourth quarter of 2010, Rajan said. Real estate and IT/ITes sector, each are expected to create 50,000 jobs. 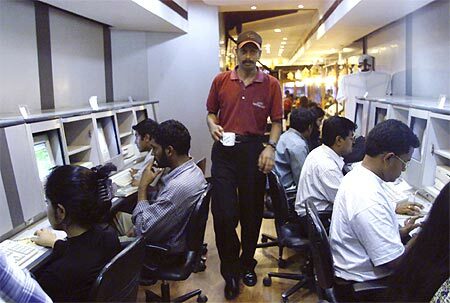 Image: Employees at an IT company in Bangalore. Education & training industry is projected to generate 30,000 jobs. Manufacturing and BFSI sectors would each be churning out 20,000 jobs in the 2010 fourth quarter, E&Y said. "This (robust healthcare) trend is expected to continue with a huge gap in demand and supply of healthcare services and increasing investment in the sector. "Lifestyle changes, increasing rural penetration and various government schemes have ensured robust growth in this sector," Rajan noted. 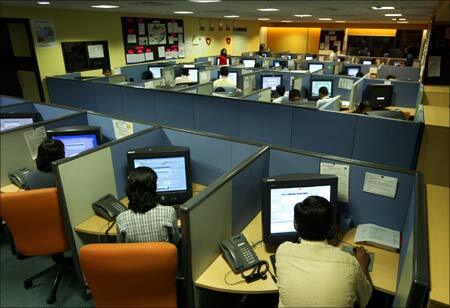 Image: Indian employees at a call centre provide service support to international customers. The healthcare sector is estimated to have added 150,000 jobs in September quarter. Pointing out that public sector companies are bullish on recruitment, he said that most of these large players are expected to increase hiring in the last three months of 2010. "Similarly in public sector banks, expansion of existing branches and replacement of retired staff are driving significant increases in recruitment...Demand for talent across the public sector banks over the coming decade is estimated to rise to 500,000," he added. 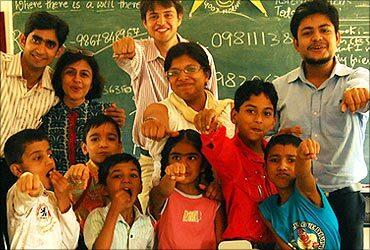 The education market in the country, estimated to be worth USD 40 billion, is also expected to generate more employment opportunities. Rajan said that a considerable demand for education and training is contributing significantly to job creation in the sector. Image: Jobs to boom in healthcare sector.